Up to 2016 nothing was known about H J Moser except his initials and surving artwork. Following research by Stuart Middlemiss it was realised that Moser had survived the War in the UK. At the same time I was contacted by a niece of Moser which led to meeting his son John Gretton, hence we have been able to build up a good biography of this important artist. -----------------------------------------------------------------------------------------------------------------------------------------------------------------------------------------------------------------------------------------------------------------------------------Hans Moser was born in Germany on 23rd October 1904, probably in Lankwitz a southern suburb of Berlin. His father Alexander was from a Jewish ancestry, the forebears having been expelled from Spain in the late 15th century. Alexander had converted to Christianity before his marriage and was an affluent stockbroker. However, like many people he lost most of his wealth in the 1930 stock market crash and the family had to move out of their luxury villa. Hans was the eldest son and one of four children, one daughter and three sons (Kate, Hans, Fritz and Rudolph). The children were brought up as Christians. Hans was a bright pupil at school but rebelled against the pedantry of his schoolmasters. On leaving school he was found a job by his father in a bank where he was equally bored. He filled his time by using the bank stationery for sketches and caricatures. After leaving the bank it is understood that he enrolled in art classes but it is believed he was equally rebellious. The studies only lasted a short time. The art classes however, resulted in Hans becoming a freelance artist. 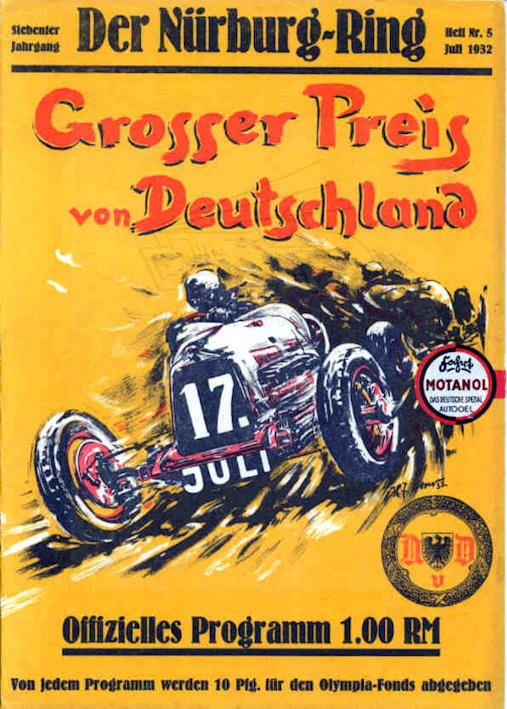 He provided illustrations for German publications ‘Motor und Sport’, ‘Kolnische Illustrated Zeitung’ and publications for the German Automobile Club (ADAC). Also by 1931 we start to see his work being used by the UK ‘Illustrated London News’. Whether he had visited the UK and made the acquaintance of staff at the magazine or his work was forwarded by an agent is not known. It is more likely to have been via his art agents who he complained always took a large part of his fees. He must have had sufficient means from his art or the family, to go racing (probably motorcycles). 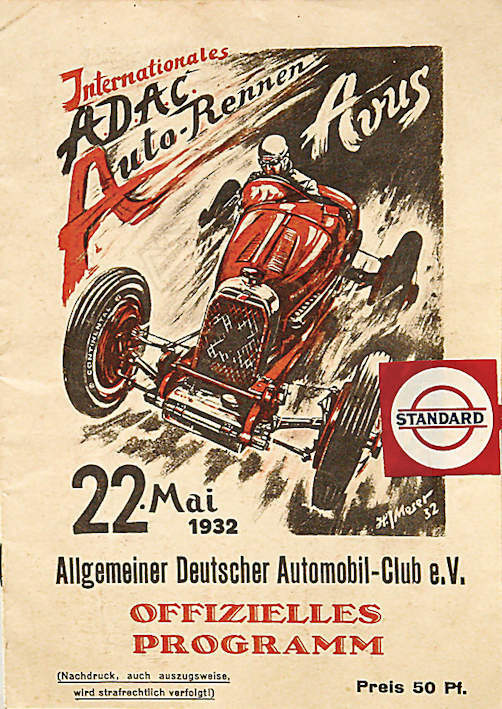 By 1932 his art was being used for car race programmes - International car races at the Avus track and later that year at the German Grand Prix at the Nurburgring. 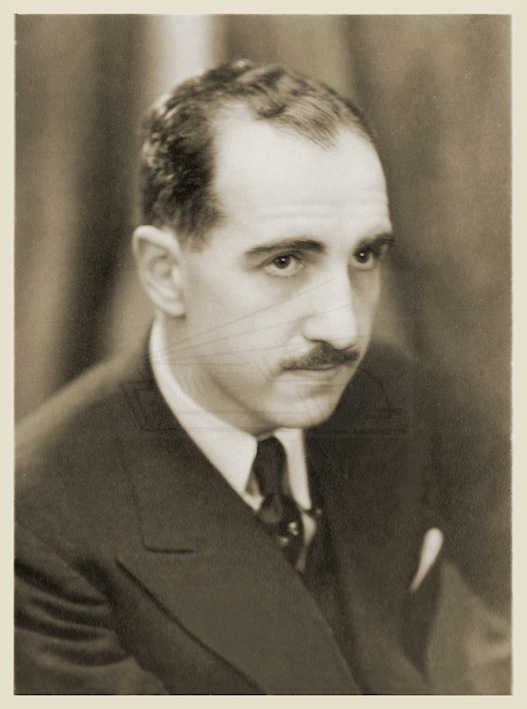 When exactly Moser came to the UK is not known but probably 1933/34. Although only half-Jewish and technically a Christian the Nazis were coming to power in 1933 and the anti-Jewish laws meant that Hans could not work as an artist. Also his father Alexander had died that year. By this time his sister Kate was living in London and her husband was working at the German Consulate as a Commercial Attaché. It could be assumed that she assisted him when he arrived in the UK. This is possibly not the case as he was very poor and times were hard. It is believed he had some commissions from ‘Illustrated London News’. He had brought from Germany a grisaille painting of the battle of Trafalgar which he showed prospective clients. This drawing is still retained by the family. It is interesting that he soon became accepted as he produced the artwork for the 1935 British Racing Drivers Club (BRDC) Christmas card. 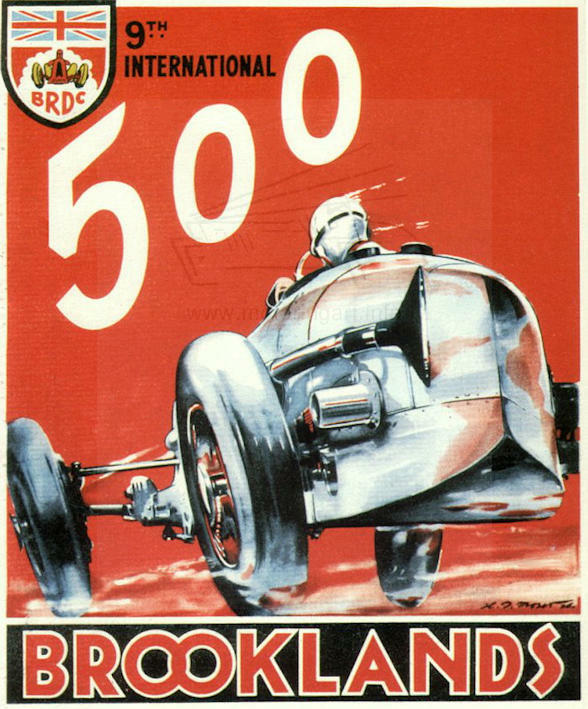 Also he sold motor art on commissions such as the view of an Amilcar on the Brooklands banking dated 1935. This is possibly one of his best examples of larger artwork is compared to the size of his normal output. Probably one of the connections that allowed him to become rapidly established was John H Gretton, a very prosperous corporate lawyer and father of his future wife. John H Gretton was a pioneer motorist and was Chairman of the MMC (Motor Manufacturing Company). He had taken part in the 1900 1000 Miles Trial. Albeit John H Gretton was probably more interested in yachting by the 1930’s but he would have still had friends in the BRDC and Brooklands. (Gretton owned a large America’s Cup type yacht). The connection with J H Gretton had probably been established via the German Consulate as Gretton was very much involved with overseas commerce. In thanks Moser had presented Gretton with the painting of Trafalgar. Hans and Joan were married in Kensington during the second half of 1936 The advent of Speed magazine (Official publication of the BRDC) in June 1935 must have been the perfect vehicle for Hans to show his talents. Besides his wonderful artwork for the covers, plus drawings, sketches and cartoons, there were also supplements in the early magazines of Moser art. These supplements were a loose slip-in, so often have been lost or removed. They allowed the readers to frame the art without removing pages from the magazine. The first supplement titled ‘Dawn’ shows an early morning view of a garage with the mechanics resting after working all night on a racing car. There is an introduction to say “These plates are the work of H J Moser a brilliant young artist, who himself has raced on the Continent, and whose drawings are only to be found in the pages of ‘SPEED’.” It is assumed that Moser was probably a salaried staff artist for Speed magazine, however something went wrong in 1937 as the supply of new artwork ceased, albeit a few cover designs were repeated. No doubt he had to fall back on working freelance. 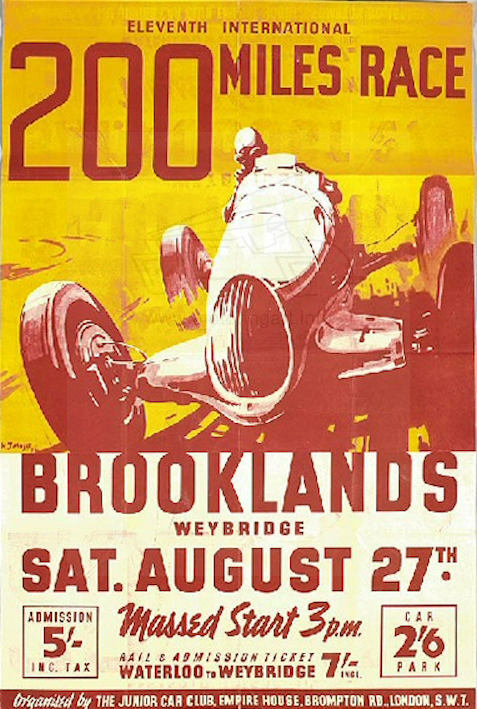 It is not known where he worked other than producing some Brooklands posters and programme covers in 1937/38 for the BRDC and the Junior Car Club. 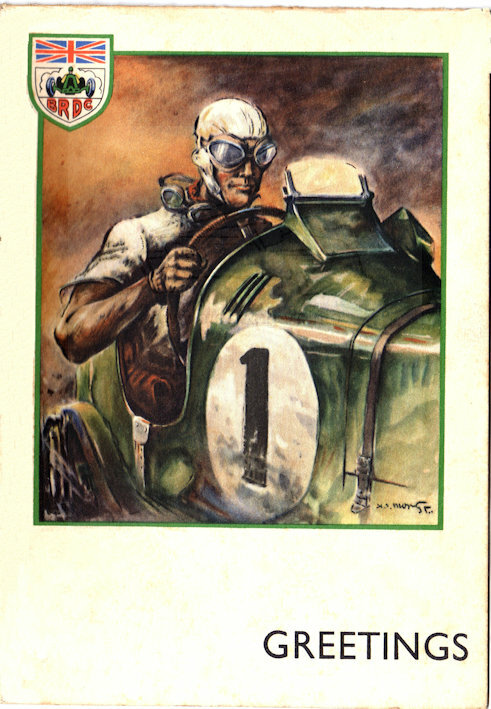 Also the cover artwork for the 1938 Castrol Achievements booklet. 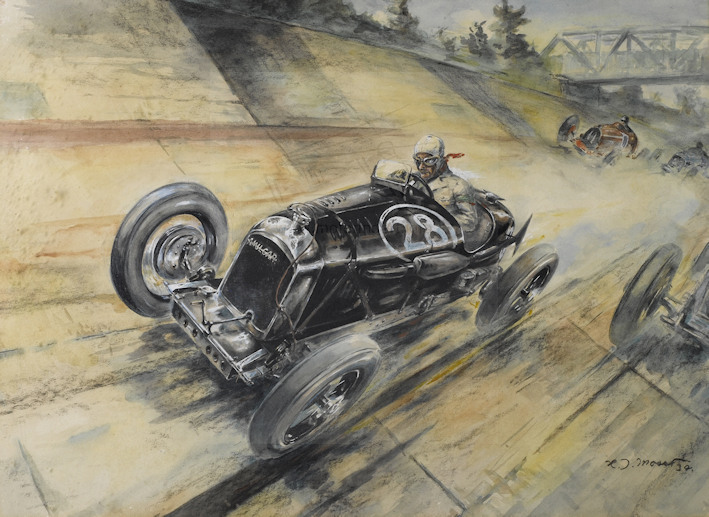 The artwork for the 1938 South African Grand Prix featured a Moser painting of a speeding red car on a banking. This had previously been used as a cover design for Speed magazine so it is assumed that Moser did not have a RSA connection but the image had been ‘lifted’ from the magazine. It is believed by the family that he raced at Brooklands in the pre-War period probably on a motorcycle but I have been unable to find any reference in the standard texts. With the start of War in 1939 Hans was given the choice of joining the Army or being Interned. He chose to join the Pioneer Corps where many similar aliens were allocated. 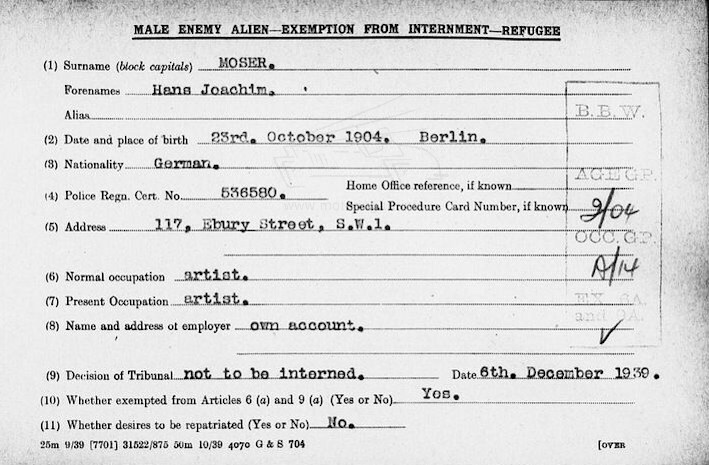 He received a Certificate of Exception from Internment on the 6th December 1939. His war service is still being researched but we know he was a Sergeant at Dunkirk. He could have been an evacuee or more likely he was there to assist the evacuation as part of the Pioneer Corps duties. It is said that he was promised a Military Medal for his work in de-commissioning the guns that were left behind, but this never materialised! After Dunkirk he joined a Scottish regiment as an Artillery Officer. No doubt his German language would have been useful in translation and later probably he worked in the Military police. 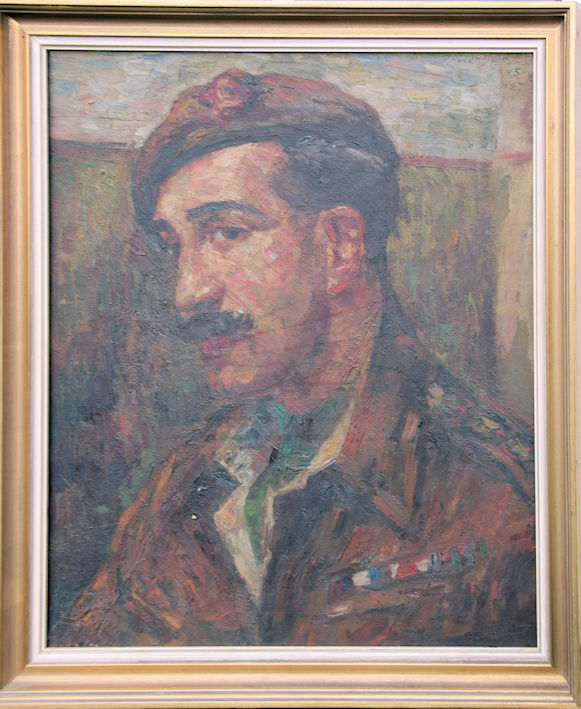 The family retain an oil portrait of him completed by a German Prisoner of War. . It is understood he was in Brussels soon after the liberation. He rose to the substantive rank of Captain but when he left the Army is not known Hans wife Joan continued to live in London and a son John A C Gretton had been born in 1941. Trying to find work as an artist immediately after the War was very difficult with the worry of having to support the family. John H Gretton had died, the death being registered at the beginning of January 1937. Probably there was no work in motoring as The Motor magazine had George Lane as its principal artist, and Gordon Horner was the artist at The Autocar. 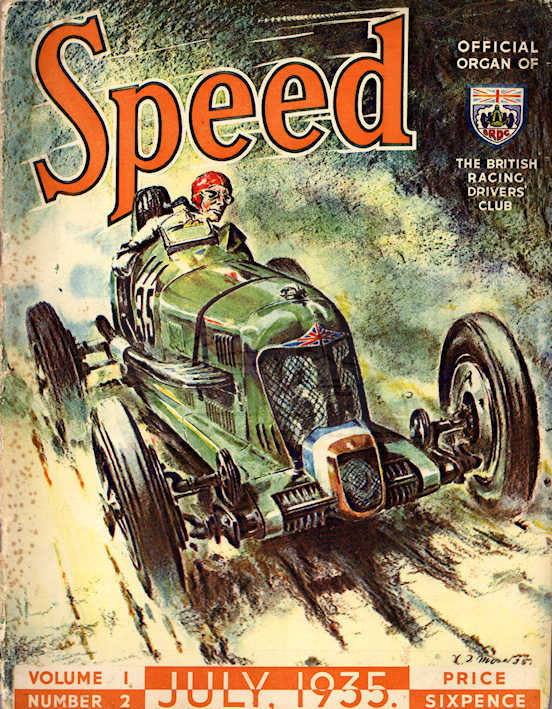 Speed magazine has ceased in 1939. It is known that Hans worked as a Freelance commercial artist and one of his clients was Metropolitan Vickers. Being commercial illustrations, little of it would be signed by the artist. The youngster John can remember his father, smartly dressed with bowler and rolled umbrella leaving the house searching for work. In common with many aliens, Hans decided to change his surname from Moser to that of his wife’s surname – Gretton. No doubt this was to assist him obtaining work as there was still considerable anti-German feeling at the time. It is recorded in the London Gazette that he swore an Oath of Allegiance on the 18th July 1947 where it says his name is John Gretton, (formerly Hans Joachim Moser). His occupation was listed as an artist living at 139 Ebury Street, Eaton Square. It is assumed that around the same time he started to sign his art as J Gretton. He never used John as a name, he was known from his war service as Jock. Was this because he served with a Scottish regiment or a contraction of his Joachim middle name? 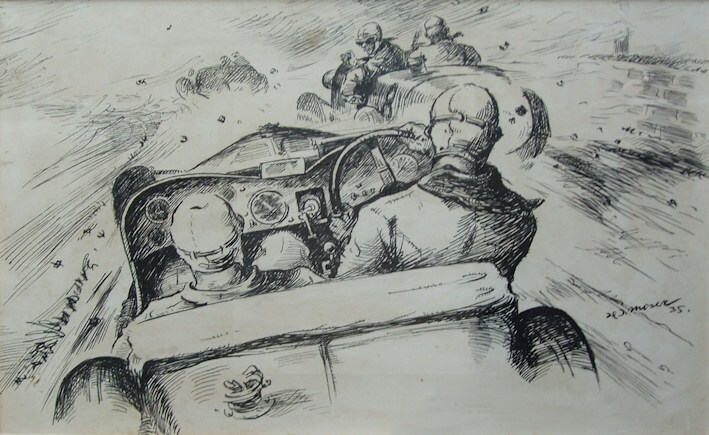 Initially the searches of past sales failed to discover any artwork signed Gretton however, his current family have a few Gretton pieces including one motor racing view of the Targa Florio circa 1928 showing the Bugatti T35 of probably Constantini leading the Alfa Romeo of Campari. (The other family Gretton paintings are nautical themes). 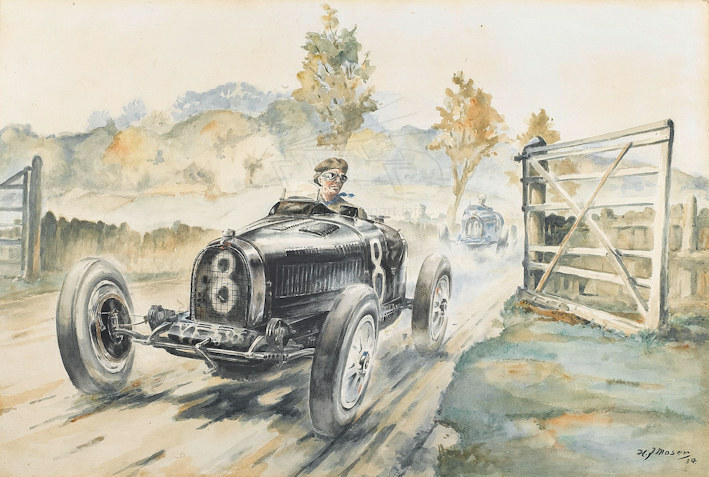 Also further searches came up with a painting of a Mercedes W163 that was sold in the 2013 Beaulieu sale by Bonhams. It would seem that his whole efforts were directed to his commercial illustration art and he had little time for painting. But John remembers his father over painting canvases of rejected artwork. It is also remembered that Jock was very skilful at model railway modelling and made a motor racing game with model cars. He also fabricated shipping models possibly on a commercial basis (one being seen in an Isle of Man museum) and two models of the German battleships Scharnhorst and Gneisenau were given to the National Maritime Museum. This model making may explain in part the lack of paintings in this period. Hans Moser/Jock Gretton died in February 1951 aged 46 of a heart attack. He was a heavy smoker of Woodbine cigarettes which probably contributed to his demise. The previous evening he had felt extreme chest pains but the family doctor refused to visit. By the morning he was dead. So passed one of the UK’s influential artists that to some extent changed the way motoring art was viewed. The styles of Crosby and De Grineau had for 30 years been the mainstay of motoring art, were now in competition with the colourful, vigorous and slightly impressionistic work of Moser. The covers of Speed Magazine were simply magnificent. This new work had a considerable influence on the young upcoming artists at the time. For example it can be seen in the later bold and loose works of Gordon Horner, with the use of bright colours reproduced on some of the Castrol Achievements booklets. The only tragedy is that so little of his original work has survived with probably less than ten motoring drawings and paintings being known to the author. 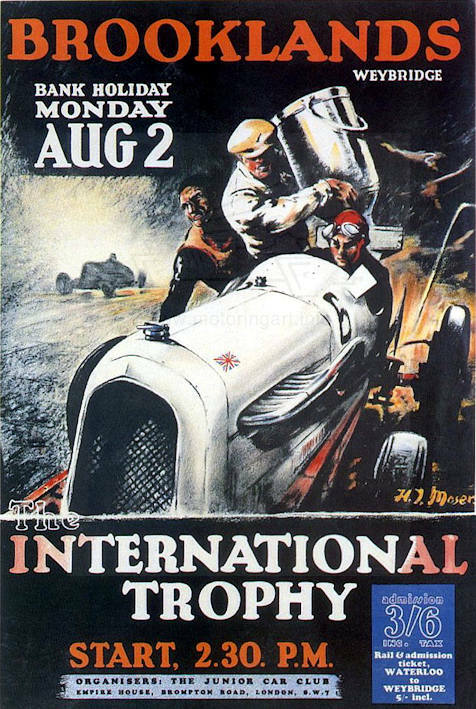 Fortunately the surviving printed copies of Speed magazine and Brooklands’ posters/programmes are testament to the work of this great artist. As a postscript – motorsport was in the family as brother Rudolph was killed at the Nurburgring in 1964 whilst driving a Porsche 904 GTS in practice for the 1000kms race.------------------------------------------------------------------------------------------------------------------------------------------------------------------------------------------------------------------------------------ Credit must be given to the initial work of Stuart Middlemiss for discovering that Hans Moser/Jock Gretton had survived the War plus the genealogical research. The rest of the story has been built up by the son John A C Gretton and family who live near me in Kent. 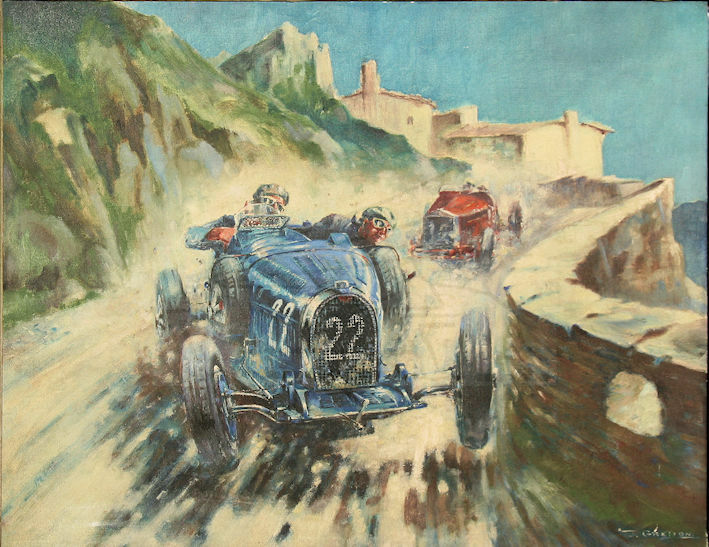 Targa Florio painting of Bugatti leading an Alfa Romeo signed J Gretton.